Your Remote Desktop session has ended. Another user connected to the remote computer, so your connection was lost. Try connecting again, or contact your network administrator or technical support group. The only way around it was to physically “Sign out” at the hardware. The fix: add a password to the account (see the notes below) and enable the “Allow only…NLA” (picture) option in the remote desktop settings. First: not a very well used Windows 8 “test” computer. When we set it up originally we didn’t put a password on it. 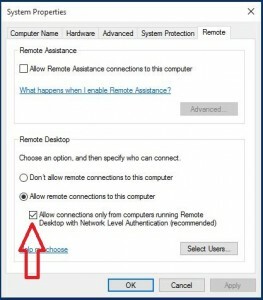 We must have had some old Macs or XP boxes that we tried to connect RDP clients from, so had un-checked the “Allow connections only…” option in the Remote tab. 2nd: No “pre-release” Windows X stuff. On July 29, 2015 we had to update this computer to 8.1 before upgrading to X. The 8.1 and the X (Ten/10) installers did not mention exactly how important a password is to these newest systems. A little online searching tells us that it’s not Microsoft’s fault, not too many people seem to have this exact series of mistakes/user errors. Finally: we ended up with a Windows X (Pro) computer with RDC (the new name for RDP) enabled, old un-secure clients allowed, and no “only user” account password. Finally: Add the new password to the RDP (RDC) client connection dialogue and everything works fine. RD Client connected, console user was Signed out. This was a very “anomalous behavior incident” but if we could do it someone else probably could as well. So, now it’s documented.